Dog bandanas are a popular new fashion trend that is catching on fast. They are available in a huge range of designs that are suitable for everyday use or for special occasions such as a birthday, Valentine’s Day or Christmas. Most dogs get used to them very quickly and are more than happy to stroll around the neighborhood showing off their style! It is important that you get the right size of bandanna for your breed of dog. A bandana that is too small is both uncomfortable and dangerous. Here we give some guidance on what to look for in the best dog bandanas and how you can fix it on your dog so they always look their best. 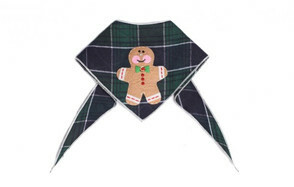 You can’t go wrong with this hand-designed cute bandana that is perfect for the festive season. Many different designs and colors are available to suit your tastes in design and your dog’s personality. There are two sizes available. The medium size would suit a breed such as a French Bulldog or a Pug as it can fit around a neck size of 8 inches to 15 inches. The large size would better suit a German Shepherd or a Golden Retriever as it suits a neck size of 16 inches to 24 inches. It is manufactured from 100 % cotton fabric and has felt applique detail added to it to complete a cute design. The edges have been stitched to make them last longer and the bandana is fully machine washable for your convenience. A must-have birthday gift for your gorgeous pooch. This dog bandana is manufactured in the US from a cotton-lycra mix. It’s both comfortable and hard-wearing and can be machine washed when it gets dirty. The dog bandana is available as a small size that fits neck sizes of 8 to 14 inches and as a large size that fits neck sizes of 15 to 20 inches. This means that most breeds can be catered for. The bandana is a vibrant pink/red color and is printed in white letters saying ‘It’s my birthday’ with a cute paw print next to it. Beneath the writing, there is a ribbon bow stitched onto the bandana. On the reverse, there is white stitch detailing around the edges. This is a functional bandana that is not just there to look good. It can help to keep your dog cool in hot conditions. It can play an important role in preventing heatstroke, fatigue and dehydration which are all very real health hazards for dogs in hot weather conditions. Remember that your dog cannot sweat and they can struggle when the temperature rises. The dog bandana is made from a material that is both lightweight and breathable so your pooch won’t mind wearing it at all. There is a convenient hole for the leash to fit through when you are out and about. All you have to do is run it under some cold water and then tie it around your dog’s neck. It retains moisture for longer periods of time than other fabrics and keeps your dog cool for several hours. When it gets dirty you can pop it in the washing machine and air dry it. It is available as a small/medium size or a large/extra-large size. Sometimes it’s just too difficult to choose the best design of bandana for your fashion-conscious pooch and luckily now you don’t have to! These bandanas are available as packs of five or ten or even 50 which is handy if you have several dogs or want to give them as gifts. You will get an assortment of irresistible designs in your pack and they all look great. They have a traditional triangular bandana design which can be worn hanging down the chest or the back. The bandanas are made from 100 % cotton which is safe and durable and are stitched around the edges to prevent fraying. It is very flexible and feels comfortable when it is against the skin. They will fit small and medium breeds. For instant cooling of a hot dog, this is the product you need! They are made from a special material that lets heat out and cools the skin. The attractive blue and white flecked design looks super-cool too. The bandana is perfectly safe and contains no toxins. It is made from a fabric that has been designed with special technology that will work to reduce body temperature rapidly. All you have to do is soak it in cold water and it will do the rest. You secure it around the neck using the Velcro fastening. It is available in three sizes. Dressing your pooch up for parties and special occasions is a lot of fun and this costume bandana is a perfect accessory. It’s made of soft and comfortable cotton and hand washing is recommended to preserve the design. It is just the right size for small and medium dog breeds. 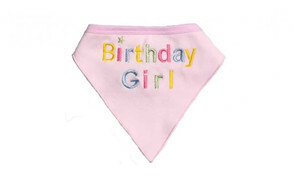 The bandana is decorated with an attractive ‘Birthday Boy’ or ‘Birthday Girl’ design to make your pooch feel and look extra special on their big day. 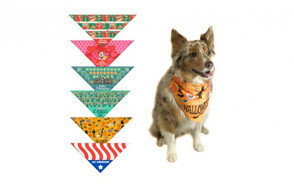 A set of 10 bandana bibs in assorted jazzy designs that will make your dog the best-dressed pooch on the block. They are all made from durable cotton for comfort and are stitched around the edges so they will not unravel. When they get dirty you can pop them in the washing machine. The pattern on this dog scarf is reversible so you get two bandanas in one and this pack of 10 gives you a total of 20 possible designs. They will fit most medium-sized dogs. Your pooch can be involved in all your holiday celebrations with a Christmas, Valentine’s Day, St. Patrick’s Day, 4th July, Halloween or Patriotic bandana. With this set of six bibs your dog will be dressed up for any occasion and can join in the fun with the rest of the family. This dog scarf will fit most medium breeds. They are manufactured from polyester with the design printed onto the fabric. All of the designs are machine-washable. You can get ready for adventures on the open road by dressing your pooch up in this territory bandanna. The design is reversible so on one side there is a jaunty blue and white abstract print and on the other side there is an Aztec design. It’s made out of a tough but soft material that will withstand the rigors of days out in the wild or in the city. You attach the dog scarf around your dog’s neck using a Velcro strip and it is available in a small or large size to suit most breeds. A double-printed triangular bandana that ties snugly around your dog’s neck, this bib will fit most breeds. Because it is printed on the front and reverse of the material you get two designs on each one. Therefore, in a pack of four, you get eight possible designs. They are made from high-quality cotton that is both safe and durable. To fit it on your dog you simply drape it around their neck and secure it in place with the ties. It will fit most small and medium breeds. Bandanas need to be comfortable. Coarse and inflexible material will irritate your dog’s sensitive skin. This could cause hair loss and localized skin irritation. It could also put your pooch off wearing it. Look for bandanas made from natural materials such as cotton and soft material such as nylon. Bandanas need to be durable enough to withstand a day with your dog! It helps if the edges are stitched as it will prevent them from fraying so this is a feature to look out for. Bandanas that can be machine washed are also less work. Bandanas are either tied in a knot or secured with a Velcro fastening. This is a matter of personal choice. You may feel that the tying method is more secure. On the other hand, you may find the Velcro fastening to be quicker to fix. It is essential that you get a bandana that fits. Most will fit small and medium breeds but you may find it harder to get one for a large dog. For example, a Rottweiler would need a bandana with a length of around 39 inches to fit comfortably around their neck. It is uncomfortable and dangerous for your dog to wear a bandanna that is too small. If the bandana seems too big, you could try folding it over a few more times. This is definitely a matter of personal preference. You may want a bandana for a special occasion such as a birthday or a public holiday like Christmas. There are plenty of appropriate designs for you to chose from. You can even get personalized dog bandanas that will feature your dog’s name or a cute message. Also, a dog birthday bandana makes a perfect doggy gift for your four-legged friend. Many bandanas come in packs of four or more assorted designs so you have a selection at home to choose from. Also, some are reversible and have one design on the front and another design on the back. This is like getting two bandanas for the price of one. Some bandanas are designed to cool dogs down in hot weather. The fabric is soaked in cold water and as the water evaporates, it takes the heat away from your dog’s body. Dogs can get injured in road traffic accidents at night and in poor weather conditions when visibility is poor. A bright bandana makes them more visible to road users. These can take ages to heal as the wounds constantly reopen. Bandages do not work well on dog’s ears but a bandana may help. Some bandanas are coated in flea-repellent and act just like a flea collar. The idea is that they kill and deter parasites including fleas. There are some drawbacks to this method of parasite control as commercial flea products can irritate the skin or even cause more serious health issues especially if the bandana is licked or chewed. Once you’ve chosen the correct size of bandana for your pooch and chosen an adorable design that you love, the next stage is to put it onto your dog. Some dogs immediately fall in love with their bandana and strut around the neighborhood thinking that they look very smart. Others are not very keen on their new accessory and may need some coaxing to wear it. The process of getting your dog used to their bandana is exactly the same as getting them used to wearing a collar. It helps if you start when they are young dogs as pups are often more accepting of new things. It also helps if they only wear it for short periods of time and if you distract them with a toy or treat whilst you are putting it on. Don’t allow the process to become a game of tug of war with your pooch or to get to the stage where you have to physically restrain them to get the bandana around their neck. If things are not going well, the best option is to give up and have another go the next day. Most owners find that it is best to stand behind their dog. Place the bandana under their chin and secure it at the top of their neck by tying it or with the Velcro fastener. Now check that it is not too tight by trying to fit two fingers between the bandana and your dog’s body. If you cannot fit your fingers in, it is too tight and needs to be adjusted immediately. This is the classic way to wear a triangular bandana. The triangle hangs underneath your dog’s chin and the bandana is tied at the back of their neck. This is basically a back to front cowboy style. All you have to do is fit the bandana as you would for the cowboy style, check that it fits and then swing it around so it looks like a cape. If you would prefer not to have a bandana style that comes to a point, you could opt for a roll tie style. Lay out the bandana on a flat surface and roll it up starting with the point of the triangle. Now tie it loosely around your dog’s neck and create a double knot which looks very chic. This may be the most formal look of all! However, it is also the most difficult so it may take a few attempts for you to perfect it. You need to fold over the bandana so it forms a long strip and then secure it by tying it into a bow underneath your dog’s chin. Some owners get very concerned about choosing the correct size of bandana. It is important that you take some time to find a product that will comfortably fit your dog. Some manufacturers supply pet bandanas in several sizes e.g. small, medium and large. Others even give a size chart where it recommends the appropriate size for different breeds. However, other products are supplied as one single size and simply give a general statement such as “fits most medium breeds”. A bandana that is too big is not really a problem because you can gather up the excess material when you tie it on. A bandana that is too small is clearly unsafe and uncomfortable for your dog. 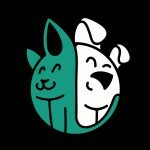 When your dog is wearing the bandana, you should be able to fit two fingers comfortably inside the gap between the bandana and your dog’s neck. If you can’t do this, it is too tight and you need to remove it immediately. The only way to be sure that the bandana will fit is to measure your dog’s neck. Then you need another eight inches or so to allow the bandana to be tied. So, if your dog’s actual collar measurement (neck size) is 10 inches, they need a bandana with a length of at least 18 inches. This would be suitable for most small breeds such as a Chihuahua. Bandanas with a length of 20 inches will fit most Yorkies and Pugs. Breeds such as German Shepherds and Labradors need a length of at least 29 inches and a Rottweiler would need a length of at least 39 inches. Q: What are dog bandanas? A: Dog bandanas are pieces of material that can be fixed around a dog’s neck. They are often triangular in shape and are fixed in place either by tying them or with Velcro. They come in many different sizes and designs and are primarily a fashion item. However, some can also perform a useful function such as protecting the tips of the ears and cooling dogs down on hot days. Q: Are dog bandanas safe for puppies? py bandanas at first, let them wear it for only short periods of time. Q: Should I remove my dog’s bandana at night? A: Pet bandanas are all about looking good so there is no need for your pooch to wear it at night. In fact, wearing a bandana at night could present a hazard. It could get caught on something and strangle them. It could also come off and get chewed by your dog which would present a choking hazard. Q: Can I wash my dog’s bandana? A: It is highly likely that you will need to wash your dog’s bandana after they have worn it. It will get splashed with mud and dirt when you are out on walks and covered in food after a meal. It may be wise to look out for a dog neckerchief that is machine-washable as this is less work for you. Many of the designs include darker textile dyes and these could run during the initial washes. You can avoid this by hand-washing them in cool water to begin with. Our pick of the best dog bandanas is a hand-designed product that is perfect for the festive season. A dog Christmas bandana is a perfect stocking filler for your pooch. It is available in many different designs and two sizes. A medium size suits French Bulldogs and Pugs but you’d need a large size for a German Shepherd or a Golden Retriever. It’s made from 100 % cotton fabric with stitched edges and is fully machine washable.